Tia grew up int the most traditional part of the Nuba Mountains. 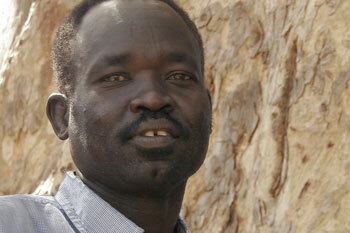 In the eighties he went to Khartoum, like so many Nuba, to earn enough money to get married. He returned to his village Kafina, but then trouble began. He joined the SPLA and is now a security officer, who has never forgotten where he came from. My name is Tia Tutu Meskin. I’m from Kafina; that’s in Kadugli County, south of the town, near Katcha. I was born in 1965. As a small child I saw that the life in Kafina wasn’t good. My father and mother had a hard life. They had no clothes; they had no good food like vegetables. Many things were lacking. Going to the fields to grow sorghum was tough work. If there was rain, we would have enough to eat, but sometimes there was no rain. Until the late seventies I walked around without clothes. I never saw a gawadja (westerner); I didn’t go to school. I was just looking after the cattle: goats and cows. Sometimes the Arab people of the cattle came to sit with me there, but the Arab people from Khartoum were not there. When I grew up I went to Khartoum to work. I wanted to see something of the world, and I also liked to get married. I had just lost most of my cows; some had died and others were stolen by the Arabs. My father didn’t have enough [to pay the bride price], so I went to Khartoum. I worked there in 1983, in a place called Al Katena, with the gawadja from Germany; they were making roads, and I worked for them as a car mechanic. After two years I became a driver; I am still a driver today. I had some money to buy a few cows. For the marriage you had to pay two cows and some goats: one goat to take to my mother-in-law, and two goats for the father-in-law. You needed to get simsim (sesame) too; maybe two sacks. You could even pay with a gun – the old one, called Marmuton. I don’t think you’ll find anyone who would figth with it though. Hahaha. Anyway, I didn’t pay a gun; just cows and goats. After my marriage in 1987, I took up working in the fields in Kafina. I got one child – she is in Khartoum now. I returned to Khartoum in 1988, just for three months, and I went again in 1989. And then the SPLA came to Kurungu. I was still in Khartoum, but I thought I would find someone to discuss things with in Kafina, so I tried to go home. I came to Kadugli with one bag and a basket full of medicine, but then someone told me: “if you go there, those people [of the army] will catch you”. So I threw away the medicine and I just kept some sweets and gifts for my family. When I left Kadugli I had to pass [a check point] before I could continue to Kafina, and the army caught us there. They asked me where I was going. I told them: “I have my child in Kafina; I just come from Khartoum to take her there.” I took out my certificate to show them that I am a car mechanic. “You see, I’m working there as a car mechanic; I want to go to Kafina to take my child back to Khartoum.” They became happy! “Okay, you go there. But watch out for the Anya Nya (rebels): they are bad people; they can kill you.” And they gave me a letter to pass without any more trouble. There were many difficulties on the way. Sometimes I didn’t get food; I just ate grasses. We had no salt, nothing. But I knew the problems, the reasons why I went there. In Kafina, my place there, two girls were taken away by the Arabs. The Arabs came riding camels and horses; there is a place of water near Tuna, where they always come. But this time they took the two girls. No one knows where they are now. One of them was pregnant. Are they still alive? Have they died? Two women were also taken; one from Tuna and one from a place nearby. Many bad things happened to the black people in Sudan. I worked there in Khartoum, but I never got anything. Those people from my place in the Nuba Mountains – from Kurungu, Fama, Kafina, Katcha, Tuna – they do the dirty work in Khartoum. Those people [the government, NotE] won’t let you learn; they won’t let you [move ahead]. The people that stayed behind in Kafina were still better off than the people that went to Khartoum. So I went to Ethiopia. I stayed there for almost two years before I returned to Kurungu. I was in Kurungu for some time, and then I went to the South, to Torit and Kapoeta and Ikodi. After an officers training I came back to the Nuba Mountains, to Brham, where I stayed with this guy called Telephone Kuku, until the enemy came to fight the SPLA there. Telephone Kuku was arrested for treason by Yousif Kuwa; did he ever talk to you about joining the government side? No, he never talked about it to me: never. Some times he would ask me what I thought about the situation. You see, the situation of the civilians was not good. They didn’t have clothes, they didn’t have good food. Even if they had enough sorghum, there were not enough vegetables. People were still walking around naked. And Telephone would ask me [what I thought] about it. Then [there was an agreement with] the Arabs, to open up the market in Brham. Telephone wanted to force people to the market. He said: “anyone who has cows must sell them, to buy clothes for himself and his wives and children.” And if you didn’t agree, he could beat you. But the people of Brham didn’t like to sell their cows; they preferred to go without shoes and clothes and keep their cows. Telephone told them: “what is happening? You have cows: go to buy [clothes].” The people didn’t like that. No, no, he was just concerned that the people should wear clothes. But then in December 1993, he tried to join the Government. If I had been angry, what could I have done? There was this big government that you could join if you liked… In the bush, anyone who has a heart will think about the things that happened, the reasons that made him go to the bush. And the simple people like to be in the bush, but those who had a good education, they didn’t like the guerilla life. Many of them, we saw them go. Mohamed Haroun; Ouwad Abdelkarim… Riek Machar went, and now he’s returning; Lam Akol went, and now he comes back… All of them had a good education. The Arabs took Brham and I went to Tabanya. For three years I was fighting against the enemy from there. There was not enough ammunition but the people struggled on. We hid behind the mountains; bombs were falling, booom, booom; we just kept quiet. There would be a lot of shooting, but we waited until [the enemy] came near, maybe one hundred meter, and then we would start fighting with them. Once they were outside [the garrisons], if they came with thirty, we might kill thirty. And the ones we didn’t kill would run, so we could take their guns and their bullets. They came with their tanks; they thought we couldn’t resist, but we divided the bullets: five for you, five for you, and we stayed there. I learned some English in Gadeil, at the Yousif Kuwa Teacher Training Centre, but I couldn’t finish my education. The army wouldn’t let me study all the time; as a soldier I had to go on duty sometimes. If here were problems or things to do, they would send me my orders and I had to go. In 2003 I was sent to Miri. The JMC (Joint Military Mission) was there at that time, and I had to stay there to see what was happening. I didn’t work with them; it was a security mission. I was hiding in the mountains to see what the people of [the government] side were doing with the JMC. I stayed there for six months, together with Ouwad Gabralla and a full battalion of soldiers. We stayed outside, in Fiki Ali, in Kuduru; places with water. When the JMC came to ask why we were there, we would just say: “why? This is our place; we can sit here, can’t we?” “What do you live from?” “I don’t have anything to eat.” And that was true: at one time we went without any sorghum for three whole months. We took the leaves of a specific tree to cook them, and we ate wild fruits, but they were no good. My body became so thin! We would be waiting at the place of water for a monkey to come and bang! we would kill it and eat it. Finally Governor Abdelaziz [Adam el Hilu] sent some people with a letter to Kafina. The village is in the government area, but the people of Kafina always helped the SPLA. They gave us some money to buy sorghum. I was walking all the way from Miri to Kafina and back, all the time. The people of Kafina helped us so much; they gave us money to buy sorghum and salt, but they would also go to Kadugli to buy shoes for us. Before, all those places were for the SPLA, but the Arabs took it them in 1999 and 2000: Kurungu, Katcha, Kafina, Tuna, Shatt – and so many SPLA soldiers turned to the other side. Now they are all coming back. Only few of them remain with the government. I was in Miri a couple weeks ago: there’s hardly anyone there. You see, two days ago, I got a letter from a friend, who lives in the government controlled area. He wrote: “don’t let the school of the SPLM come here.” In all those areas that the government took: Kurungu, Fama, Katcha, Shatt, where the SLA was before, you can’t open schools like the ones we have here in the SPLM area [with an English curriculum, oriented towards the African culture rather than to the Arab culture, NotE]. Only Qur’an schools are allowed. Even yesterday some people from Holland told me that the government doesn’t want them to hand out radios to the people there to educate them. How do you feel about the CPA? Will the peace bring something good? Aaaaaaar…. okay.... There is peace, but up to now, I haven’t seen any changes. There are schools, but the children are still sitting under rakubas (shelters); there are no proper school buildings. Up to now there are no roads, up to now there is no hospital. If you see Lueri, you may think thre is some change, but really, nothing has happened. You know, since the peace, people can return [to the Nuba Mountains], but only few people do so. They say: “what? If I go there, there is no school, there is no hospital. What can I do if I go there? If I get sick, they have to carry me to Kadugli on a bed.” If there’s a hospital, if the schools are open, if there is good water, those people from Khartoum will come. But not like this. Now, I think that if the money [from Khartoum] comes to our [state] government, the government can build the place, and help the returnees. The gawadjas can help us with other things. If you would like [to start] this [project] or that, the government can write a letter to support you. Let me take you back to Kafina for a moment: when the people there were naked, they also had their tradition. Then clothes came, and religions like Islam and Christianity maybe… did it change the traditions a lot? No, no: up to now, they haven’t changed the dances. The traditions are still there. We may have put on clothes, but the tradition continues. We have bogsa, we have nogarra, we have kese, we have wushi: the people keep it. Those people in the Arab side say: “you can leave these things, these traditions are not okay according to Islam.” But in the SPLM side, you have the right to do anything; no one will say this is wrong or that. I’m a Muslim now, but if I go to Kafina, I can take of my shirt and put ashes on my body; I can put on the gush-gush, and go to play the bogsa. The traditional dances are meant to ensure good rains, good harvests, aren’t they? You ask for rain for example. Now you believe in Allah – but if you go dancing: who do you ask for rain? Interviewed in Kurchi on April 4 , 2006.